We are honoured, we have spent the last three years developing Football Superstars and to be considered for this nomination is indeed an honour. 2) What kind of year has 2010 been for Football Superstars? It’s been one hell of a ride; reaching more than 1.5m registered users. In addition we have set up our own in house team for the ongoing management and development of Football Superstars IP. In short it’s been and continues to be a fantastic year, if 2011 is anything like this then we are in for another great ride. High quality game offered within the F2P environment, freemium content bringing football to the masses. I think it would have to be Footy Tube as we are very much into video as a means of communication. Words are great but nothing beats video for getting so many things across in an engaging and efficient way and Footy Tube does this best. 5) What’s next for Football Superstars? We are making many more changes to FS adding features that we could have only dreamed about 6 months ago. We will be adding further real world brands. I have and this is something we could definitely use for our virtual world ranking, currently this is handled by our own leaderboard system. The best footballer in the world has to be Lionel Messi because he has raw talent, flare and passion for the game. 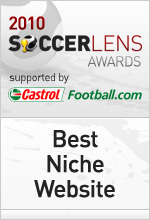 Back to the main 2010 Soccerlens Awards nominee interview page.